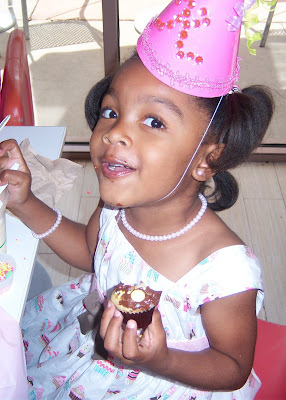 Over the weekend I had a surprise birthday party for my little princess. She did not have a clue of what was going to happen on Saturday. My daughter thought she was only going out with daddy, for a special date. She did go out on a date ,with a surprise ending. Kayla date ended at Sweet by Good Golly Miss Holly. Before Kayla arrived, her friends made special birthday cards and paper cupcakes for her. Once the birthday princess arrived, everyone decorated chocolate and vanilla cupcakes with icing and sprinkles. The party ended with Daddy reading, If You Give A Cat A Cupcake, to Kayla and all her friends. I, er... WE love Sweet cupcakes!